Have a question about your Handicap Index? Consult the list of questions below, and if afterward your question still isn't answered, email handicap@scga.org. Can a club start offering this at any time or does it have to be started at year-end? Who is responsible for providing the club information to the SCGA to get started? Can the club ever change any information? What credit card types can be used on the membership portal? Are there any fees to the club or individual for participating in this? Who at the club gets notified that a member has joined or renewed online through the membership portal? How often is the club contact notified via email? If a club uses the portal, can that club then pay its SCGA invoice/statement amount via credit card? Does the new member learn about who to contact at the club? Does the club have to input member information into the GHIN database via GHP Online Club? How quickly does a new member receive an SCGA/GHIN number? Can an existing member update his or her contact information so that our club has the best possible information to use? How does the club learn of the profile information entered during the process so that it can contact its new member? Can a former member of our club, who is now inactive, again become a member of our club using the online commerce tool/portal? Is there both a join and a renew capability and do we have to use both? Our club has one membership type that includes all of our tournaments and another membership type that does not include tournament eligibility. Can we use the online membership portal for both membership types? Can we charge one fee for first-time members, a different fee for renewing members up to a certain date, a different fee for renewing members after a certain date and another fee for those who actually let their memberships expire with the commerce portal? We charge juniors and seniors different fees than other members. Can that membership portal accommodate this? Do all of our members have to participate in auto-renewal? Is there an auto-renewal membership option with this program? Do members who sign up for auto-renewal have the ability to opt-out of this feature later? If a club inactivates a member who is scheduled for auto-renewal, will the auto-renewal charge go through? When will auto-renewal take place for a member? If a member does not choose the auto-renewal feature while joining or renewing a membership, but decides that auto-renewal makes sense, can a change be made regarding participation? Will a club have to address inactivation dates or anything similar for a golfer who is set up for auto-renewal? When our club goes in to inactivate members and/or set inactivation dates for those not participating in the SCGA’s online membership payment program, we see dates listed for some golfers. Should we change those dates? If a member signs up for auto-renewal, but opts out via either the four or two-week emails, will the club have to do anything to inactivate the golfer? If our club wants to change its membership prices for a new year, and a golfer is scheduled for auto-renewal, what should be done? Can a member scheduled for auto-renewal actually inactivate membership online? How often are Handicap Index values revised/updated? How many scores does it take to establish a Handicap Index? I just joined a club and have 18-hole scores in my scoring record but my handicap shows NH. Why? I didn’t get my latest eRevision (bi-monthly email with updated Handicap information). What do I do? I have an “R” next to my Handicap Index? What does that mean? I have an incorrect score in my record. How do I fix it? I was asked what my Course Handicap is; How do I figure my Course Handicap and what is this concept? For posting scores for handicap purposes, what is an ESC or Adjusted Gross Score? Which value do I use for posting purposes or determining my Course Handicap? Am I required to choose the MEMBER LOGIN feature in order to post a score on scga.org? If I look up my scoring record, it seems that it does not include my recently posted scores. Why? What is the Low Handicap Index (Low H.I.) and how is it calculated? Am I required to be a part of a golf club in order to obtain a Handicap Index? How do I get my SCGA membership card? Q: How do I join the SCGA and get my Handicap Index? Q: What is a USGA/GHIN Handicap Index? Q: Do I have to join a golf club to join the SCGA? Q: How do I get a Handicap Index? Q: What's the difference between an Associate Membership and a Regular Membership? Q: What is the difference between GHIN and other Handicaps out there? Q: How do I post a score? Q: How do I renew my membership with my previous golf club? Q: What else does my membership include? Q: How do I renew my membership with a different club? 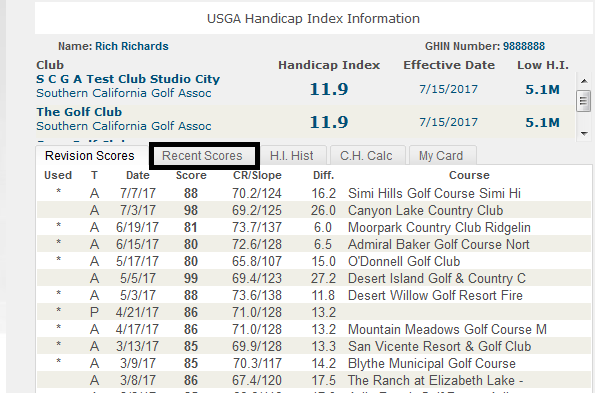 Q: I've posted scores, when do I get a Handicap Index? Q: Can I keep my same GHIN number if I change clubs? Q: Do I have to play with my golf club? Q: My membership expired. Do I still get to keep my same GHIN number? Q: Can I post rounds that I played before I'm a member? Q: Does my score history get deleted if my membership expires? Q: Can I set my membership to renew automatically? Q: Am I a USGA member when I join the SCGA? Q: I can't find where to renew my club membership online. How do I renew? Q: I have more questions regarding a Handicap Index, where do I go? Q: I have more questions - can I talk to somebody on the phone? Q: Can a club start offering this at any time or does it have to be started at year-end? A club can begin to offer this at any time. Most would probably start when most of their membership activity takes place, but nothing precludes a club from starting at any time. Q: Who is responsible for providing the club information to the SCGA to get started? The club identifies an individual contact point for the SCGA to work with. The club contact can fill out the form at scga.org/access or it can identify a person and ask the SCGA to walk through the preparation with that person. In either case the SCGA will work with the club contact to make sure everything is set up correctly. Q: Can the club ever change any information? Yes, we recognize that things can change. We would ask the individual contact for the club to reach out to the SCGA Member Services Department to ask for a change in information. Changes in dues from year to year will need to be communicated PRIOR TO September 1. The SCGA will implement the change and allow the contact for the club to review and confirm any modifications. Q: What credit card types can be used on the membership portal? Q: Are there any fees to the club or individual for participating in this? There are no additional fees. This is an SCGA member service. Q: Who at the club gets notified that a member has joined or renewed online through the membership portal? The club initially identifies a single contact to receive email notification. The club can have other people added to the notification list by contacting the SCGA. Q: How often is the club contact notified via email? The club contact is notified seconds after any membership transaction is completed. Q: If a club uses the portal, can that club then pay its SCGA invoice/statement amount via credit card? Q: Does the new member learn about who to contact at the club? In the confirmation email, the new member will receive a club contact name and email address for any questions. Many clubs are planning on sending a welcome email to the new member; the SCGA will automatically send its welcome to the SCGA email as well. Q: Does the club have to input member information into the GHIN database via GHP Online Club? No, the new member fills out a profile during the process and this data is automatically loaded into GHIN. Q: How quickly does a new member receive an SCGA/GHIN number? A new member receives his or her SCGA/GHIN number seconds after the transaction is completed as part of an email notification that everything has been completed. This member can immediately begin to post scores after receiving this number. Q: Is the credit card information secure? https:// is in place during the input and utilization of the credit card information. This is the standard in the industry and uses Secure Socket Layer that encrypts information. Q: Can an existing member update his or her contact information so that our club has the best possible information to use? Yes, during the procedure the member’s profile will be made available for review and updating. This updated information will be stored in the GHIN database and is accessible via GHP Online Club at any time. Q: How does the club learn of the profile information entered during the process so that it can contact its new member? The identified club contact will receive the profile information in the member joined confirmation email. It also can use GHP Online Club to access the member’s individual record and/or generate a club roster at any time. Q: Can a former member of our club, who is now inactive, again become a member of our club using the online commerce tool/portal? Yes, a player can be found via SCGA/GHIN number or name and if the member is inactive can be reinstated. Q: Is there both a join and a renew capability and do we have to use both? There is both a join and renew capability, accessible through a single button/link. A club does not have to offer both joining and renewing capability. The good news is that if an existing member clicks on the button/link, the program will realize that the person is a member of the club and is renewing and price accordingly. Similarly, for a brand new member to a club chosen, the program will determine that this person is new to the club and ask the right questions and price accordingly. Q: Our club has one membership type that includes all of our tournaments and another membership type that does not include tournament eligibility. Can we use the online membership portal for both membership types? Yes, We can accommodate as many membership types as your club offers. We give you an opportunity to describe the benefits of your membership types in approximately five lines of text so that prospective members can determine which choice suits them best. This concept also applies to individuals comparing clubs and their benefits. Q: Can we charge one fee for first-time members, a different fee for renewing members up to a certain date, a different fee for renewing members after a certain date and another fee for those who actually let their memberships expire with the commerce portal? Yes, we will confirm all of your various pricing models and automate these functions so that you do not have to remember to change something on date x.
Q: We charge juniors and seniors different fees than other members. Can that membership portal accommodate this? Yes, by using the date of birth entered into the golfer’s profile, pricing can be automated. Similarly, this also will determine whether a golfer is eligible for the SCGA Junior discount, where we do not charge a golfer SCGA dues if under the age of 18. Q: Do all of our members have to participate in auto-renewal? NO. The auto-renew feature is optional for each member. Q: Is there an auto-renewal membership option with this program? YES. A club can choose to allow its members to optionally participate in an auto-renewal option, easing the collection of dues for the long term. Q: Do members who sign up for auto-renewal have the ability to opt-out of this feature later? Q: If a club inactivates a member who is scheduled for auto-renewal, will the auto-renewal charge go through? NO. When a member is inactivated, auto-renewal is also inactivated for that member. Q: When will auto-renewal take place for a member? If a member joins/renews through the portal during the Oct. 1-Dec. 31 open enrollment period, auto-renewal for that member will occur exactly one year later from that join/renew date. If a member joins/renews through the portal from Jan. 1-Sept. 30, auto-renewal for that member will occur approximately November 20 of that year. Q: If a member does not choose the auto-renewal feature while joining or renewing a membership, but decides that auto-renewal makes sense, can a change be made regarding participation? Given that auto-renewal is chosen during the membership payment process, the member would not be able to activate the auto-renewal feature until the next membership cycle/year. Q: Will a club have to address inactivation dates or anything similar for a golfer who is set up for auto-renewal? Example 1: The program is set up so that, for example, a golfer who pays for membership on November 15, 2016, will have an inactivation date of December 31, 2017, because that individual has paid 2017 dues. If that person chooses auto-renewal and lets that go through, the individual will be charged for 2018 dues on November 15, 2017, and the inactivation date will be reset to December 31, 2018, because that individual has paid for 2018 dues. Example 2: The program is set up so that, for example, a golfer who pays for membership on January 15, 2016, will have an inactivation date automatically inserted into the GHIN database of December 31, 2016. If that person chooses auto-renewal and lets that go through, the individual will be charged for 2017 dues on December 31, 2016 and the inactivation date will be reset to December 31, 2017, because that individual has paid for 2017 dues. Q: When our club goes in to inactivate members and/or set inactivation dates for those not participating in the SCGA’s online membership payment program, we see dates listed for some golfers. Should we change those dates? NO. If you see a date listed for a golfer that is in the future, especially a date of December 31 a year into the future, it is because the person has paid for membership online and the SCGA has noted this accordingly. Please leave these dates alone. And while the year will be different than your club’s “manual” inactivation effort, it is suggested that a club use a date other than December 31 for clarity. Q: If a member signs up for auto-renewal, but opts out via either the four or two-week emails, will the club have to do anything to inactivate the golfer? NO. For a member who originally signs up for the auto-renewal program, but later opts out, the program automatically inserts an inactivation date of December 31 for the relevant year. (The program actually sets that inactivation date the moment the golfer joins through the portal, then resets the date when the automatic renewal is processed). For comfort, a club could look to see if an inactivation date has been set in the GHIN database. Q: If our club wants to change its membership prices for a new year, and a golfer is scheduled for auto-renewal, what should be done? Any club desiring to change its dues structure MUST notify the SCGA PRIOR TO September 1. (All clubs offering the auto-renewal option will receive a reminder about this approximately August 1). This allows the member that is scheduled for auto-renewal a chance to see the upcoming pricing change in the four-week advance notification email, and be given an opportunity to opt out of auto-renewal. See sample auto-renewal notification message that includes pricing breakdown earlier in document. Q: Can a member scheduled for auto-renewal actually inactivate membership online? Technically NO, but practically yes. The club is the only entity in position to inactivate a membership; the member can only opt-out of the automatic renewal function. However, if a member opts out of automatic renewal and does nothing else, the membership will expire automatically at the end of the year because a set inactivation date has automatically been set for the golfer. A club official really needs to do nothing in this situation and club should not be charged for this individual. Example: Golfer joins through the portal for 2016 membership on December 15, 2015 and elects auto-renewal; program sets golfer’s inactivation date to 12/31/2016. That golfer will receive the first reminder notice about auto-renewal approximately November 15, 2016. If that golfer opts out of auto-renewal at that time, then no attempt will be made by the program to charge the golfer’s card for 2017 dues. If the golfer does nothing more, the inactivation date of 12/31/2016 will kick in and the golfer will become inactive on that date. Q: How often are Handicap Index values revised/updated? A Handicap Index is updated on the first and fifteenth of each month. Q: How many scores does it take to establish a Handicap Index? A player needs a minimum of five 18-hole scores to calculate a Handicap Index (or 10 nine-hole scores). See “How is a Handicap Index Calculated?” below for more details. Q: I just joined a club and have 18-hole scores in my scoring record but my handicap shows NH. Why? Your scoring record will show NH (no Handicap Index) until it goes through a revision on the 1st or 15th of the month. In the interim, if you need your Handicap Index prior to the revision, your club's Handicap Committee can issue you a local handicap when at least five scores are posted (identified by a capital L - ex. 15.4L). Q: I didn’t get my latest eRevision (bi-monthly email with updated Handicap information). What do I do? Make sure you have made revisionupdate@ghin.com part of your “approved/safe sender” list. This is the “from” address for the eRevision. Make sure the report is not sitting in your spam folder. Also, the system is set up to try to deliver an eRevision up to three (3) times (three revisions). After three failures delivery is discontinued. You may print out your Handicap Index information from the SCGA website's Handicap Index Lookup just by choosing "print." Another option to show/confirm your Handicap information, including Handicap Index, is by downloading the GHIN Mobile App and entering your information. Once logged in choose the “MY CARD” feature to display your Handicap Index and scoring information. “Stats” breaks down the detail of each of your scores, including the USGA Course Rating and Slope Rating for each posted score, the handicap differential associated with each score, a “trend” telling you where you are headed handicap wise as if handicaps were being updated today, along with an average of your scores. Q: I have an “R” next to my Handicap Index? What does that mean? The “R” indicates that a golfer is being reduced due to exceptional tournament scores. The reduction is an automatic part of the Index calculation each revision. Eligible tournament scores stay in a stored tournament file for a year from the date of the score or remain as part of the most recent twenty scores within the scoring record. Each revision, the formula looks at what the golfer’s traditionally calculated (Section 10-2) Handicap Index is, then checks to see if there are at least two tournament differentials in the tournament file of at least 3.0 below the calculated Index value, which causes a formula (Section 10-3) to determine whether the golfer will be reduced. The calculation also considers the total number of eligible tournament scores (number of tournament scores with a T designation in the last twelve months) in the record, as well as the spread between the normal Index calculation and the average of the best two tournament score differentials). The reduction is checked for at each revision for every golfer, because it is part of the USGA formula. This is not a penalty, just part of the formula’s effort in identifying potential ability, recognizing that a player has to have scored at least 3.0 better than the normal calculation at least twice for this to even be considered. Because this is checked for at each revision, this value is not locked in as the Handicap Index for any specific duration. An individual impacted by this portion of the formula who believes that it is inappropriate can contact their club’s Handicap Committee to discuss. The SCGA is not authorized to change a member’s Handicap Index and will not recommend that a club do so based on more recent poor play/performance, given that the value is based on potential ability. Q: I have an incorrect score in my record. How do I fix it? A golfer must contact their club’s Handicap Chair to have a score corrected or removed. The SCGA normally does not perform any file maintenance requests that come directly from individual members, unless it is clear that a score has been replicated in error. Q: I was asked what my Course Handicap is; How do I figure my Course Handicap and what is this concept? Your Handicap Index is a generic standard that is not tied to any course or tees. In order to get the right value for a particular day, you need to convert the Handicap Index into what is called a Course Handicap for playing purposes each time you play. There are many ways to determine your Course Handicap for the tees you will be playing, but you will need the Slope Rating for those tees. There are often charts near golf course computers used for score posting; those same computers will convert your Index under “Handicap Lookup”; if you use the GHIN Mobile App chose the C. H. Calculator; or use the scga.org Handicap Index lookup and after entering your SCGA/GHIN number and bringing up your scoring record, choose the C.H. Calculator tab and enter the Slope Rating for the tees being played. In general, a player’s Course Handicap will be equal to or greater than the Handicap Index when playing a tee with a Slope Rating of 113 or more, and less than the Handicap Index when playing a tee with a Slope Rating of less than 113. Q: How is a Handicap Index calculated? Once your score file consists of 20 scores, your ten lowest differentials are added together, divided by ten and then multiplied by 96%, the result being your Handicap Index. You do not round the result. Your ten lowest differentials are used, not necessarily the ten lowest scores in your score file. Q: For posting scores for handicap purposes, what is an ESC or Adjusted Gross Score? An adjusted gross score is a player’s gross score adjusted under the USGA Handicap System procedures for unfinished holes, conceded strokes, holes not played or not played under the Rules of Golf, or Equitable Stroke Control (ESC). ESC is the downward adjustment of individual hole scores for handicap purposes, in order to make handicaps more representative of a player’s potential ability. ESC sets a maximum number that a player can post on any hole depending on the player’s Course Handicap. The Adjusted Gross Score/ESC score is the score that you post for handicap purposes. Q: Which value do I use for posting purposes or determining my Course Handicap? The SCGA issues the rating values and populates the computers tied to GHIN, the SCGA website and the USGA website. Please use the computer display/SCGA.org information. Often times a course will print a large number of scorecards and continue to use those until they run out, even if new ratings have been issued. Q: Am I required to choose the MEMBER LOGIN feature in order to post a score on scga.org? Q: If I look up my scoring record, it seems that it does not include my recently posted scores. Why? Q: What is the Low Handicap Index (Low H.I.) and how is it calculated? The Low Handicap Index is the lowest Handicap Index value that an individual has had in the last 24 revisions/12 months. It is not calculated; it just looks at each of the issued Handicap Index values that a golfer has on record during the time period. Q: Am I required to be a part of a golf club in order to obtain a Handicap Index? Q: How do I get my SCGA membership card? Your SCGA membership card, tied to your club with the various partner benefits, including the Roger Dunn $15 gift card, is emailed to you by the SCGA. Cards may take up to four weeks for processing and delivery. Membership cards are no longer connected with the delivery of FORE magazine in any way.